On right top corner write your mobile number, you will receive updates regarding your claim to this mobile number. Field 1 name of the member, Write the name of the EPF member as it is present in the EPF portal. 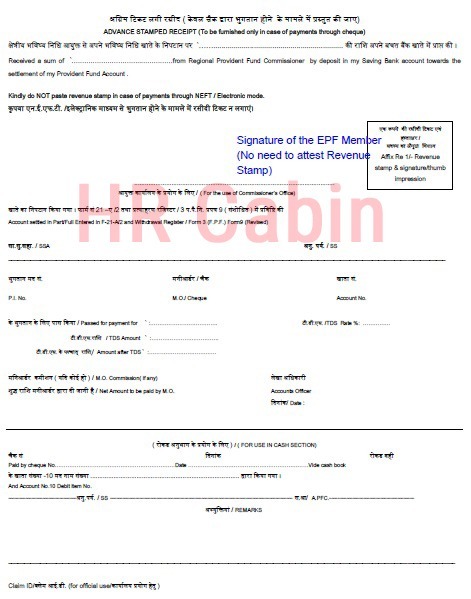 Field 2 father’s name or husband’s name, Write father name or husband name of the EPF member. Field 3 date of birth, Write the date of birth of the EPF member as per the EPFO portal. Field 4 name and address of the factory, Put address stamp of your employer. Field5 PF number and UAN number, Write your PF account number and UAN number. Field 6 date of joining in the establishment, Mention your date of joining in the establishment. Field 7 date of leaving the service, Mention your date of leaving the service i.e date of exit. Field 8 reason for leaving service, Write reason for leaving the service, whether it is retirement or resigned etc. Field 9 PAN and form 15G details: If your service is less than 5 yrs and you are withdrawing more than 50000 Rs then mention your PAN number and submit Two copies of form 15G and One copy of PAN card. In other cases just leave this field blank. Field 10 full postal address, Here write full postal address of the EPF member. In case your claim forms are rejected then rejected PF withdrawal forms will be sent to this address. Field 11 mode of payment, Write your bank name, bank a/c number, IFSC code and address of the bank. Be careful in writing this details, because if you write the wrong details then your PF claim will not settle. Finally, sign the page 1 of PF form 19 and take your employer attestation also. On page 2 of PF form 19 sign across the revenue stamp box, and there is no need to attest 1 Rupee revenue stamp on PF form 19. PF form 19 needs two signatures of EPF member on page 1 and page 2. Employer needs to sign on the first page of PF form 19. So total 2 signatures of EPF member and 1 signature of employer are required on PF form 19. There is no need to attest One Rupee revenue stamp on PF form 19. 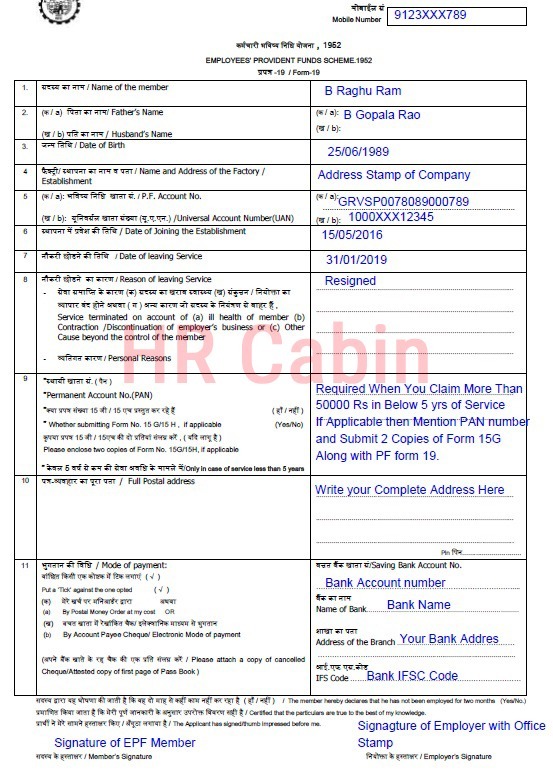 Note: Recently Employee Provident Fund Organization has introduced PF composite claim forms aadhaar and non aadhaar, EPF members can use either those new forms or old PF claim forms like Form 19 and 10C to withdraw their PF and pension amounts. Login to UAN member portal with UAN number and password. Now go to online services in the primary menu and click on claim form 31, 19 & 10C. Now in the new page, you will find your details like name, dob, father name or husband name and mobile number along with your KYC details like Aadhar, bank account details and also your service details. If you find everything is correct then click on proceed for the online claim. Now you have to choose the type of the claim i.e whether it is PF advance withdrawal (Form 31) or PF withdrawal(Form 19) or pension withdrawal(Form 10C). After selecting the claim an OTP will be sent to your registered mobile number, now enter that OTP and submit your claim. After successful submission of the claim, you will receive an SMS confirmation to your mobile number. Remember you need to submit both form 19 and form 10C separately in the online PF withdrawal process. Still, if you have any question on filling PF form 19 then ask those questions in below comments section. Dear Sir, While processing online withdrawal of PF, do we need to attache scan copy of both form 19 and Form10C? But the site says your bank details are expired so you update latest bank details through your employer/unified portal. I update in unified portal but this details are shown in pending KYC.i contact the employer but they are irresponsible. You can submit EPF composite claim form non aadhar or normal PF form 19 &10 Cwith your employer attestation and submit a cancelled cheque with your PF claim form. At present UAN based forms are not in use. I am working in accenture 1year but I dnt know my UAN No and my previous mobile no is change so pls guide me for pf withdrowel process. see the below comment from EPF after they rejected my claim. Do I need the employer signature for PF final settlement ? If your KYC like Aadhar, bank account details, and PAN details are not linked to your UAN number then you have to take your employer signature. I have relieved from my pervious company on February 2015. I had tried to withdraw my pf amount through my employer but it was not successful, and not sure of the reasons, and I couldn’t get much help from them. My KYC ( Aadhar, PAN) details are updated in UAN portal. How Do I withdraw my PF amount ? Please note that I was unemployed for 6 months before joining another company. My new company has established a new UAN account now. Yes, now you can able to withdraw your PF amount either in online or offline by submitting EPF composite claim form Aadhar. If you don’t mind, please guide me, how do I do it in Online ?